Eating fresh fish is a serious business in Sicily – it is eaten cooked in many ways but also raw (called pesce crudo). In Sicily, tuna and swordfish used to be the other most common types of fish eaten raw (especially as a starter) but eating other types of pesce crudo (raw fish) is becoming much more fashionable as Sicilian chefs respond to the inspirations and influences of the wider world and appreciate tastes and trends from other cultures. Recently, I was commissioned to write an article about Sicily’s pesce crudo by Great British Chefs, a food multimedia company that publishes recipes and other cooking-related material via its website. Great British Chefs, has expanded into Italy . 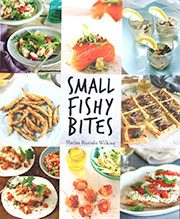 . . Great Italian Chefs and the article published on their website is called PESCE CRUDO. Walking through the fish markets in Sicily is always a joy; the hustle and bustle of locals seeking out the best produce among the colourful stalls and traders is what makes the island such a charming place. There is more than one fish market in Catania, but the principal market in the southwest of the Cathedral Square is one of the largest in Sicily. However, wherever you are on the island will never be too far from fresh fish. Sicily’s fish markets have vast, colourful, varied displays of exotic specimens such as sea urchins and edible algae to the more conventional octopus, squid, tuna and swordfish. Small, live fish swim circles in buckets of sea water, snails crawl about and all types of shellfish, especially the gamberi rossi (red prawns of Sicily), look dazzling. You know the fish is fresh – their shells and scales glisten in the sun. Swordfish and tuna, the traditional staples of Sicilian cuisine, are the centrepieces of the market stalls. They are often displayed whole, the swordfish bill like a spear thrusting upwards. At other times, their massive round carcasses lie like a trunk on the fishmonger’s bench, while the tuna is sliced vertically and horizontally before being filleted along the length of its spine, while all its parts are laid out, testifying to its freshness. The photos in this article were taken over my numerous trips to Sicily (Thank you also to Bob Evans and Angela Tolley). 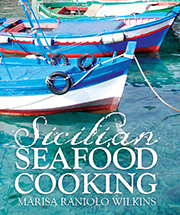 Some of these photos are in my book Sicilian Seafood Cooking.